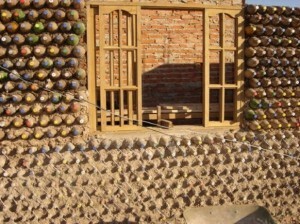 This is currently being done in a variety of ways such as simply stacking bottles, either empty of filled with earth. 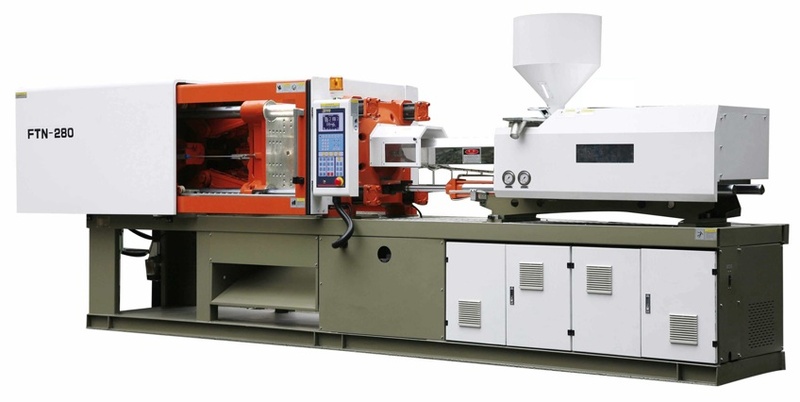 Polli brick melts down bottles and recreates a part called a parison (image below right), this requires very precise engineering, and a very expensive plastic injection molding machine (image below) to make. The Parison is then blown into the polli-brick shape. 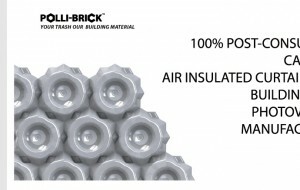 http://www.miniwiz.com/miniwiz/en/products/living/polli-brick see this video for technical details of how a polli-brick is created. http://www.miniwiz.com/miniwiz/en/projects/polli-boat/item/2 see this video for the story of how all this came together, funding, project & people. What is new. The method I envision can easily reform bottles into a single common shape designed to create structures. 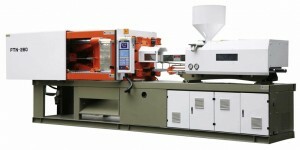 It eliminates the complex and costly injection mold and press. 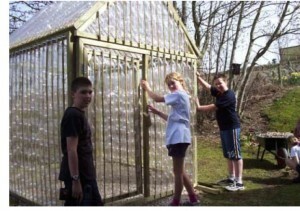 $1M estimated needed for the Polli bottle. And replaces it with extremely simple, easily copied tooling made from materials available in even very primitive regions. 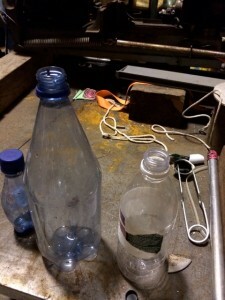 The basic principle here is that when bottles are blown, they want to shrink, but can’t because the plastic is cooled and solidified when the bottle is placed into a mold and compressed air is forced into it defining it’s unique shape while it cools and hardens. Reheating bottles allows them to shrink back towards the original test tube (parison)(see images below) shape of the injection molded part they started as. Inflating them in a different mold reforms them into a new uniform and stackable shape. 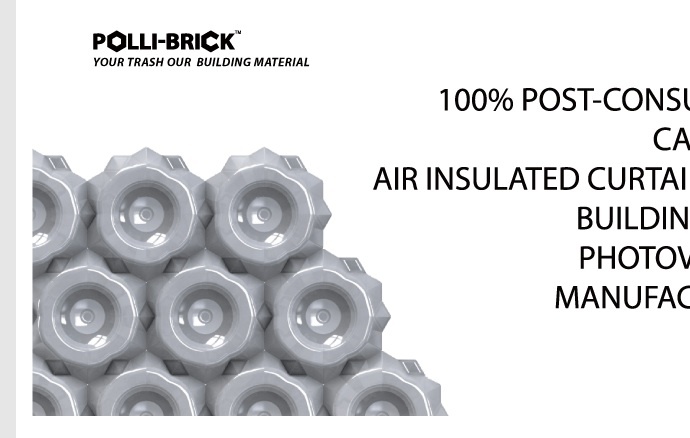 Below is a schematic of how the Polli Brick is produced, my process replaces the first and most costly and complex step (recreating the parison) with an existing bottle which is then shrunken to the parison like shape, then re-blown into the block mold. 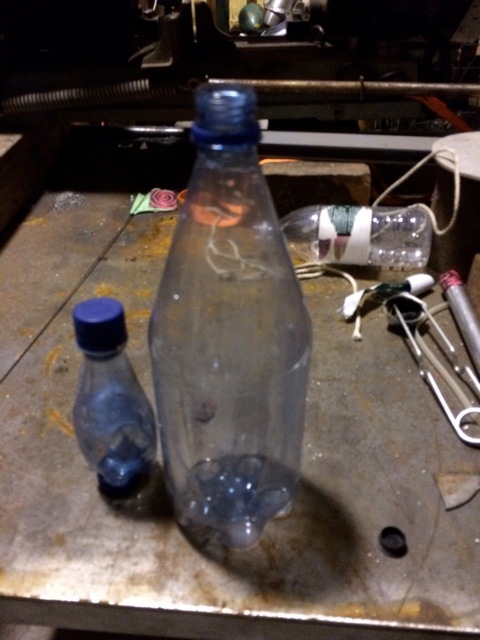 The bottle on the left was the size of the bottle on the far right before heat shrinking. A primitive idea of the reformatted bottles appears below. 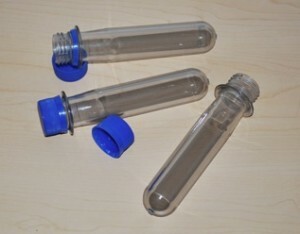 Tests I have done show that the typical bottle will shrink to about half the size of the full shape. While the bottle is still soft, it is re-blown into a new shape, that of the bottle block. 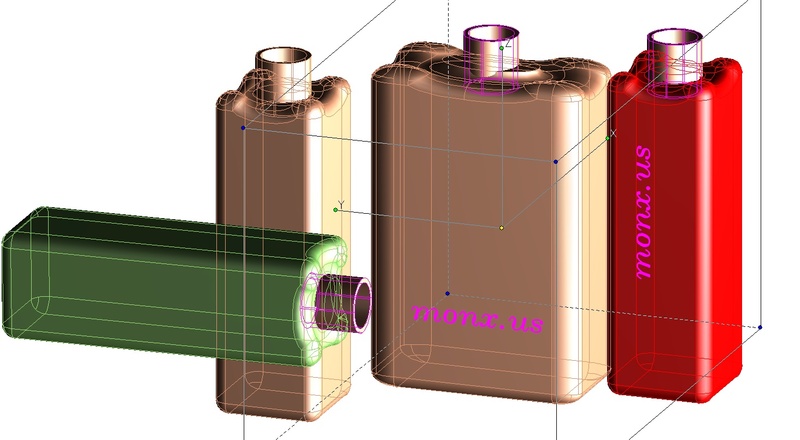 Through this method, a diverse array of bottles of similar volume can be reshaped to a single, uniform structural component. I am envisioning the bottle block filled with a mycylial mix, such as Ecovative is currently demonstrating. 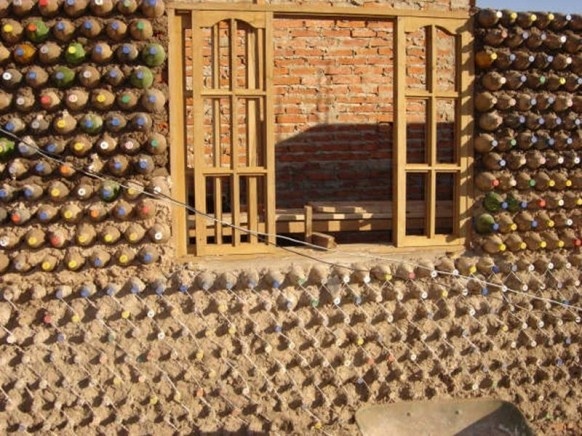 The bottles provide a natural mold for mycilial growth, the food provided by local waste plant material. The combination of the mycilial growth through the plant material increases its strength, fire resistance and insulatory properties. Alone the bottles are very combustible, but with the myclia adjacent to it, it is much less easily burned because of the greatly reduced surface area. 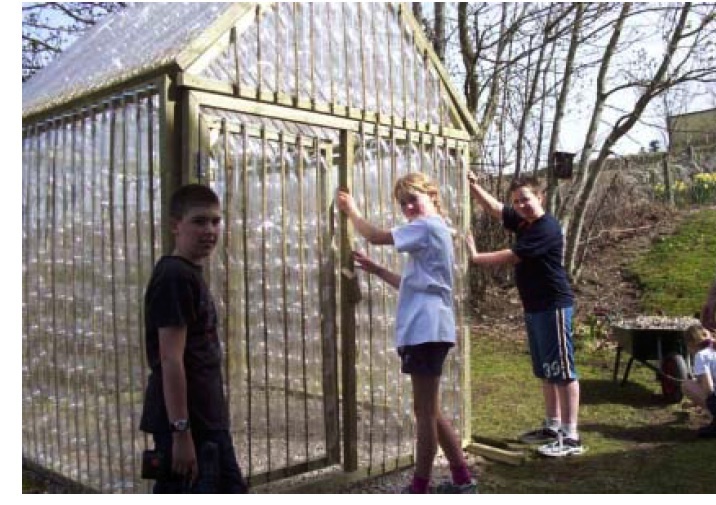 The bottles provide a sealed membrane to maintain a desired environment inside and out, both during growth and use phases. The amount of moisture could be selected based on a variety of parameters. The myclia is encapsulated, the adjacent surfaces, smooth and nonporous, provides a barrier to prevent degradation from weather and damaging life forms, ie termites, mold. I learned of the incredible complexity of providing a novel building material. Strength, fire, weather, mould and insect, plant and animal damage are just some of the issues to be addressed to succeed. And lower cost than comparable solutions. Embeded Energy: Captures more of the embeded energy in the bottle, requires heat: 400° oven or hot liquid, and time to create. approximately equal to the heat needed to dip it in boiling water for 30 seconds. Tools: Cleaning tank, blow pipe that can grasp diverse neck shapes, resist heat and deliver valved compressed air to re-inflate the bottle. Heat source to reformat the bottle. oven or hot liquid around 400 deg f. Mold to produce shape. can be cast in concrete, 2 pcs, copied from any brick. Starting with safety, materials need to be tested for consistent strengths, compression and failure analysis needs to be done. Initially the bottle blocks can be used as infill while the strength is evaluated and explored. Explore the viability of various growth media and innoculants. Various interlock, fastening and sealing strategies need to be evolved. The critical path for me is to determine that the reformatting process is simple, robust and easily copied. This involves getting the blow tube & clamp a little more refined, and the compressed air connection, then make and test some simple molds. This will show me that there aren’t any early deal breakers, such as blowouts or inability to reform or make a useful shape. I don’t expect this, and will get good feedback on temperature, pressure and optimum re-expansion size and shape, and what geometries and tolerances can be held. The next phase will be to design the “universal brick” this will involve the feedback from above, with a study of the parameters of the actual bricks. The goal being to create an easily created part, requiring few tools, little energy and minimal skills to transform bottles into a shape that can be used in a variety of ways to build structures to condition and create space. Defining the optimum brick shape involves many parameters such as symmetry, stacking patterns, dealing with foundations, doors, windows and corners to name a few. Part of creating the universal brick will be exploring the unique characteristics of the product. 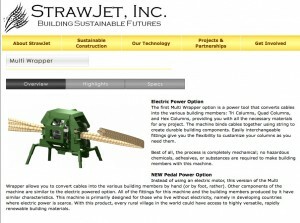 The media is more compliant than conventional material, such as bricks but lighter. Even two dimensional tiling is complex as seen below. three dimensional interlocking parts are even more so, with a Rubic’s cube like variety of options.